Well priced; Smooth UI; Dual-SIM functionality; Good screen. Terrible camera; Lacklustre gaming performance. 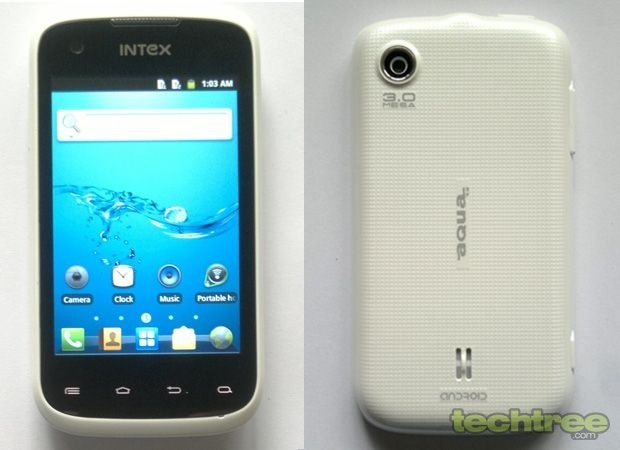 Intex, generally known for PC peripherals, has been in the mobile phone business for quite some time. Its lineup includes a plethora of mass market dual-SIM handsets. The latest entrant to this family is a smartphone — the Aqua 4.0. However, Intex has slotted it in the entry-level segment. Let's see how it measures up. The retail package has the phone, earphones, and a charger with a detachable cable. The device measures 4.5" (l) x 2.4" (w) x 0.5" (12 mm) (d), and tips the scales at 113 grammes. The handset has a decent design that won't draw any polarized reactions. The Aqua 4.0 feels good to hold, and its textured back panel provides a comfortable grip. More importantly, the phone doesn't make a creaking sound when pressed near the corners. All in all, the build quality is good. Dual-SIM GSM (900, 1800 MHz); 3G (2100 MHz). 3.5", 2-point capacitive touchscreen with pixel dimensions of 320x480. 800 MHz CPU, 256 MB of RAM. 131 MB of internal storage, 32 GB microSD card slot. 3 mp main and 0.3 mp front camera. 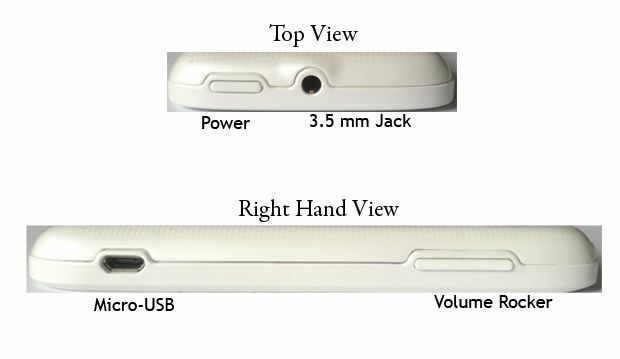 3.5 mm audio jack, Micro-USB port. 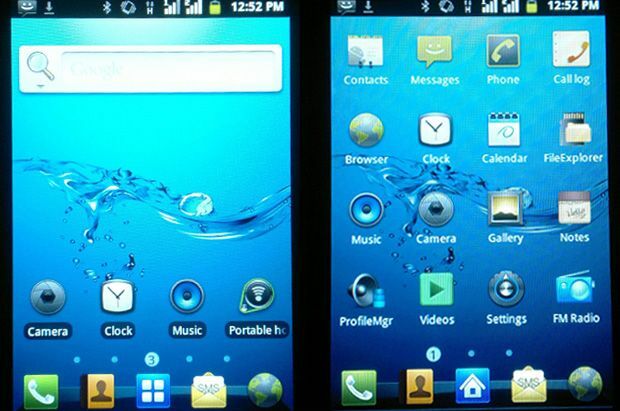 The Aqua 4.0 comes with Android 2.3, and there's no information about the possible ICS update. Intex has done a good job at keeping the interface clean and easy to use. Its 800 MHz CPU does a commendable job at keeping things virtually lag free when you swipe through the homescreens. However, the lack of power becomes apparent when you play a game like Fruit Ninja. What's worse is that its GPU is incapable of handling Temple Run. The default web browser is good at rendering pages. It's a pleasant surprise from an entry-level smartphone. On the other hand, the GPS receiver fails to lock onto satellites. However, Google's Maps suite works well with A-GPS (Assisted GPS). The Aqua 4.0's sound quality is strictly OK. It ships with terrible earphones, and even a good pair of aftermarket IEMs can't make it any better. Moreover, equaliser settings are sorely missing. 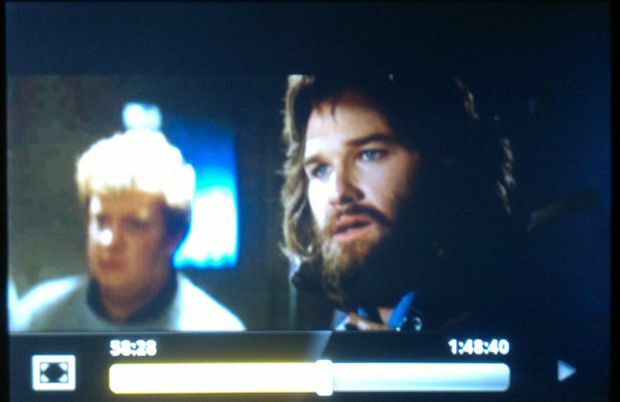 The default video player can play MP4, DivX, and XviD videos. It fails to handle a few high-bitrate 480p files. This can be taken care of by third-party video apps such as the RockPlayer to some extent. However, courtesy the feeble CPU, 720p files are a no-no. The onboard 3 mp fixed-focus camera lens lacks an LED flash. It offers effects including Sepia, Negative, and Blueish. Additionally, you get to play with exposure and ISO settings. These don't really make a difference, because the image quality is terrible. Video recording quality is no better than that of the still photography. The 480p 3GP clips you shoot turn out very grainy. During our tests, the handset's call quality and signal reception was great. Since it's a dual-SIM dual standby device, the Aqua 4.0 offers SIM settings that allows you to assign a particular SIM for voice, data, or messaging. Check the second screenshot in the gallery for more information. The onscreen portrait keyboard is well-designed, and the landscape one is even better. The 1400 mAh battery can last for almost 5 hours of video playback. Under normal use, it can get you through most of the day, which is pretty good for a dual-SIM Android phone. Available for around Rs 5,500, the phone offers many features, Android OS, and a clean UI. It does have its drawbacks — a poor camera and lacklustre gaming. Considering the price, though, I'd say it's still a good deal. If you want a bigger screen though, you're better off with Micromax's Ninja 2 A56.